I'm not quite ready to call it "elegant," but the Brabus rear-grille-and-shark-gill treatment seems to work a lot better on the Mercedes GLA compact SUV than it does on the the blockier Gelandewagen and GL-Class. Think the lack of steroidal fender flares is what keeps this car, crossover, mini-'ute, or whatever you want to call it out of the stratosphere of insanity. That said; it definitely takes me back to the European street racing scene of the original Midnight Club PS2 game. More than a little bit. 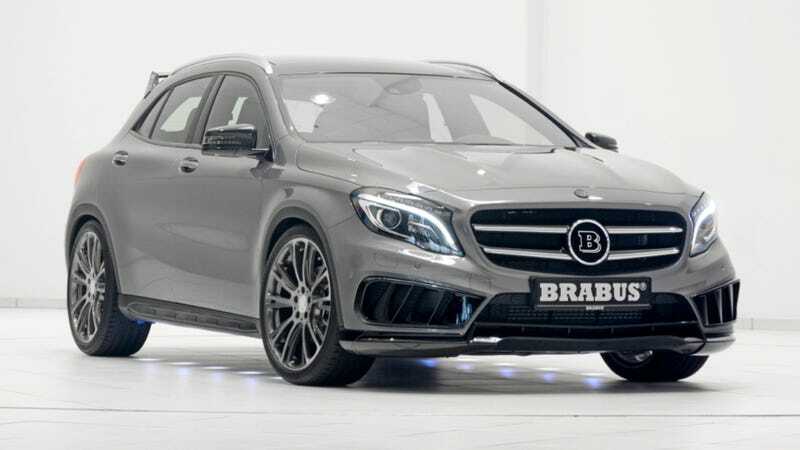 Seems hard to believe the new-Mercedes buying class of rich folks would want their cars to look like re-swaged hot hatchbacks, but I guess I've never actually seen a Brabus-bodykitted car on the road. Hey, yeah, who the heck is buying these?